The Fretless is the Canadian fiddle foursome playing an essential part in the traditional Irish folk music movement. Through the deconstruction and transformation of the usual rhythmic, harmonic and structured arrangements of fiddle styles around the world, The Fretless push traditional music into new plains. Debuting in 2012 the band has steadily moved into the public eye, winning Instrumental Album of the Year at the Western Canadian Music Awards and Instrumental Group of the Year at the Canadian Folk Music Award, along with a Juno award for their 2016 album Bird’s Nest. Their most recent album, Live from the Antfarm, takes this a step further leading the charge in a new wave of folk music. The Fretless is an innovation in music that must be heard. They harbour all the energy of fiddle tunes, while shattering expectations. 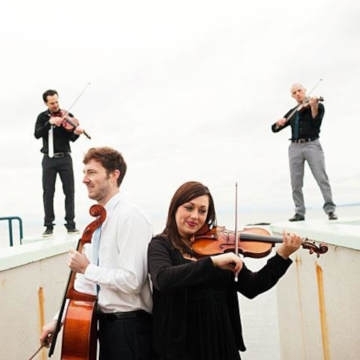 Their approach takes string music to fascinating new places as it transforms traditional tunes and folk melodies into intricate, beautiful, high-energy arrangements. An absolute must-see.